At long last, we finally have our eight Super Bowl matchups. In Division 3, Tewksbury showed that a tough regular season schedule can pay dividends as it defeated highly touted Duxbury to advance to the Super Bowl. The Redmen will face off against Springfield Central who exerted revenge on St. John's from a season ago defeating the defending Super Bowl champions, 52-20. For the second consecutive season and third time in four years Nashoba is headed to Gillette Stadium. The Chieftains scored 28 unanswered points, including 17 in the second half, to blow past Gloucester and earn a matchup against Dighton-Rehoboth. The Division 5 matchup was settled as Nipmuc continued its blistering postseason by taking care of Longmeadow while Scitaute showed that its offense is as good as any in the Bay State with a runaway victory over Swampscott. One season after coming up a game short of a Super Bowl appearance. Stoneham left little doubt in this year's state semifinal game. The Spartans dominated Littleton from the opening kickoff to clinch a showdown with Old Rochester. Blackstone Valley Tech nearly upset Mashpee in last year's Div. 7 Super Bowl and will have another chance to win a title this year as they outscored Wahoncah 13-0 in the second half yesterday to win their state semifinal matchup. The Beavers will take on a St. Mary's team who suffocated Cohasset defensively, forcing three turnovers and not allowing the Skippers to reach the end zone. Finally, in Division 8, Pope John showed why they were widely considered the preseason favorites using their speed and athleticism to blow past West Bridgewater. Awaiting the Tigers will be a St. Bernard's team that put an exclamation point on its road to Gillette with a 44-0 win over Hoosac Valley. Division 8: Pope John vs. St. Bernard's. For the second consecutive week, Sheskey was a standout performer. The rising star rushed for 210 yards on 26 carries and a pair of touchdowns as Scituate defeated Swampscott, 45-14, to reach the Division 5 Super Bowl. 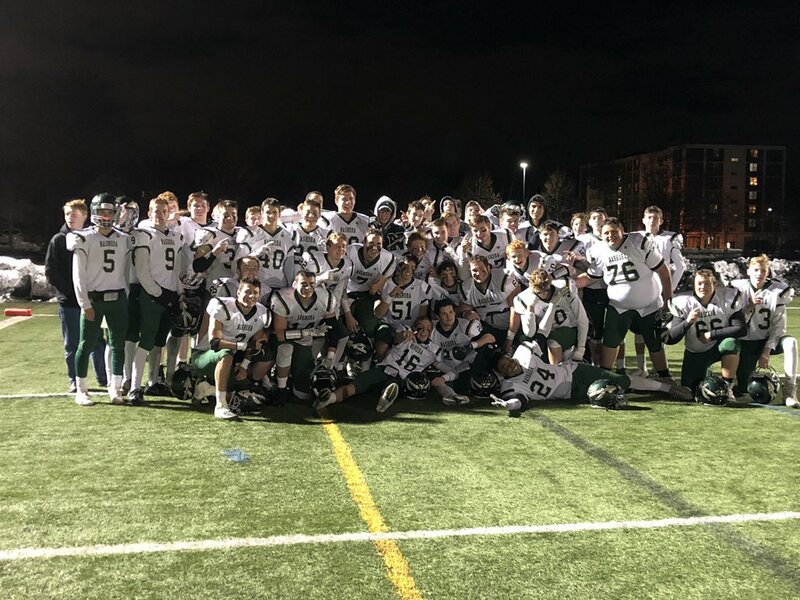 Bolinsky finished with 150 passing yards and four touchdowns as Nashoba scored 24 unanswered points to defeat Gloucester and reach its second consecutive Super Bowl. Kyles dominated on the ground, rushing for 143 yards and two touchdowns to propel the Golden Eagles to a 56-20 win over St. John's and a berth in the Div. 3 Super Bowl. Russell was a force on both sides of the ball rushing for 135 yards and a score while also adding a touchdown reception and a pair of interceptions to lead Stoneham past Littleton, 35-0, in the Div. 6 State Semifinals. Going against one of the top offenses in Massachusetts, Tewksbury's defense came up clutch highlighted by the play of Wilson. The senior defensive back had a pair of interceptions, including one at the goal line in the fourth quarter, to guide the Redmen to a 29-21 and a Div. 3 Super Bowl berth. Broni was all over the field on Saturday night, rushing for 159 yards on 26 carries and two touchdowns as Nipmuc clinched a Super Bowl appearance with a 24-9 win over Longmeadow in the Div. 5 State Semifinals. Pope John is headed to its first Super Bowl since 1998 and its largely due to the play of Smith-Howell. The senior two-way star rushed for 140 yards and a touchdown while also adding an interception as Pope John defeated West Bridgewater, 31-14. Morales continued his terrific season, rushing for 100 yards and two touchdowns to lead St. Bernard's back to Gillette Stadium with a 42-0 win over Hoosac Valley. Brunelle shined in St. John's season-ending loss to Springfield Central reeling in 13 catches for 160 yards and two touchdowns. The junior wide receiver accounted for two of the Pioneers' three scores.